(Phys.org)—Scientists at Arizona State University are celebrating their recent success on the path to understanding what makes the fiber that spiders spin – weight for weight - at least five times as strong as piano wire. They have found a way to obtain a wide variety of elastic properties of the silk of several intact spiders' webs using a sophisticated but non–invasive laser light scattering technique. 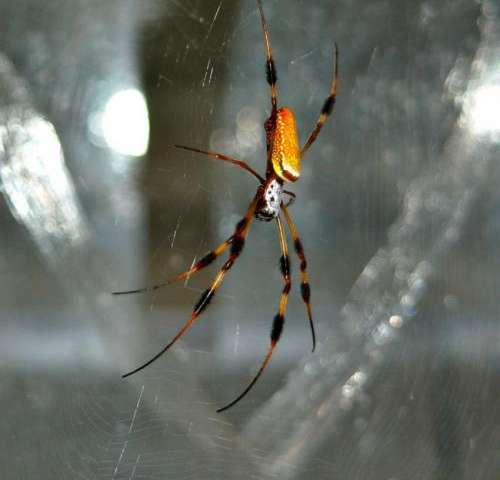 "Spider silk has a unique combination of mechanical strength and elasticity that make it one of the toughest materials we know," said Professor Jeffery Yarger of ASU's Department of Chemistry and Biochemistry, and lead researcher of the study. "This work represents the most complete understanding we have of the underlying mechanical properties of spider silks." Spider silk is an exceptional biological polymer, related to collagen (the stuff of skin and bones) but much more complex in its structure. The ASU team of chemists is studying its molecular structure in an effort to produce materials ranging from bulletproof vests to artificial tendons. The extensive array of elastic and mechanical properties of spider silks in situ, obtained by the ASU team, is the first of its kind and will greatly facilitate future modeling efforts aimed at understanding the interplay of the mechanical properties and the molecular structure of silk used to produce spider webs. 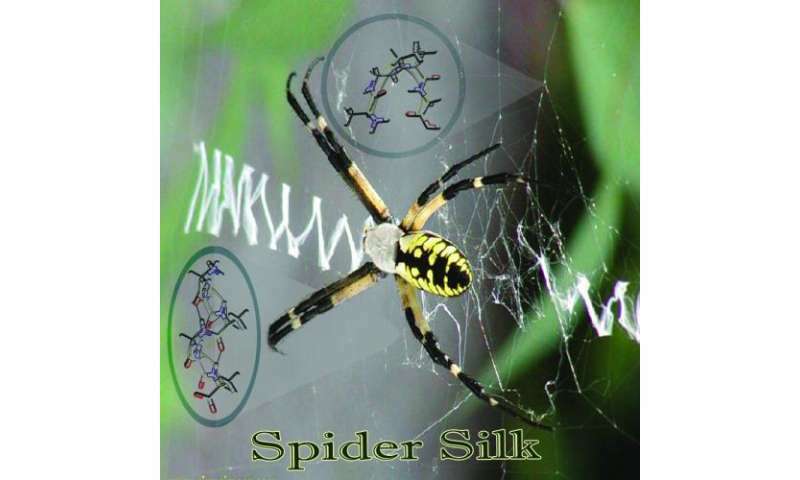 The team published their results in today's advanced online issue of Nature Materials and their paper is titled "Non-invasive determination of the complete elastic moduli of spider silks." "This information should help provide a blueprint for structural engineering of an abundant array of bio-inspired materials, such as precise materials engineering of synthetic fibers to create stronger, stretchier, and more elastic materials," explained Yarger. Other members of Yarger's team, in ASU's College of Liberal Arts and Sciences, included Kristie Koski, at the time a postdoctoral researcher and currently a postdoctoral fellow at Stanford University, and ASU undergraduate students Paul Akhenblit and Keri McKiernan. The Brillouin light scattering technique used an extremely low power laser, less than 3.5 milliwatts, which is significantly less than the average laser pointer. Recording what happened to this laser beam as it passed through the intact spider webs enabled the researchers to spatially map the elastic stiffnesses of each web without deforming or disrupting it. This non-invasive, non-contact measurement produced findings showing variations among discrete fibers, junctions and glue spots. Four different types of spider's webs were studied. They included Nephila clavipes (pictured), A. aurantia ("gilded silver face"-common to the contiguous United States), L. Hesperus the western black widow and P. viridans the green lynx spider, the only spider included that does not build a web for catching prey but has major silk elastic properties similar to those of the other species studied. The group also investigated one of the most studied aspects of orb-weaving dragline spider silk, namely supercontraction, a property unique to silk. Spider silk takes up water when exposed to high humidity. Absorbed water leads to shrinkage in an unrestrained fiber up to 50 percent shrinkage with 100 percent humidity in N. clavipes silk. Their results are consistent with the hypothesis that supercontraction helps the spider tailor the properties of the silk during spinning. This type of behavior, specifically adjusting mechanical properties by simply adjusting water content, is inspirational from a bio-inspired mechanical structure perspective. "This study is unique in that we can extract all the elastic properties of spider silk that cannot and have not been measured with conventional testing," concluded Yarger.